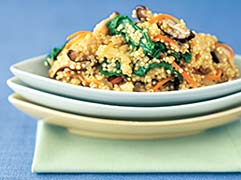 Quinoa (pronounced KEEN-wah) has a subtle nutty flavor that pairs well with a variety of seasonings. In a large saucepan, heat the olive oil over medium heat. Add the onion and saute until soft and translucent, about 4 minutes. Add the garlic and quinoa and cook for about 1 minute, stirring occasionally. Don't let the garlic brown. Add the stock and bring to a boil. Reduce the heat to low and simmer until the quinoa is almost tender to the bite but slightly hard in the center, about 12 minutes. The mixture will be brothy. Stir in the arugula, carrot and mushrooms and simmer until the quinoa grains have turned from white to translucent, about 2 minutes longer. Stir in the cheese and season with the salt and pepper. Serve immediately.